Two lance , two set of nozzel . To cater the variegated demands of our clients, we are highly engrossed in trading a qualitative range of Electric Battery Sprayer. As per the demands and requirements of the clients, we are offering them premium quality Backpack Knapsack Sprayers. This Backpack Knapsack Sprayers is highly demanded by clients for its excellent and effective results. 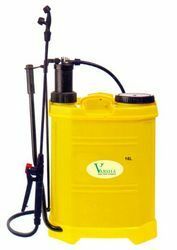 We offer this Backpack Knapsack Sprayers to the clients at market leading prices. Our team of dedicated professionals is engaged in offering Sarthak Spray Pump, which is known for its high quality and long shelf life. Keeping in mind ever-evolving requirements of our respected clients, we are manufacturing a premium quality range of Battery Operated Sprayer. We are offering Heavy duty Battery operated sprayers. This is rechargable battery sprayer, charging above 5 Hours and Discharge Time Above 5 Hours. This is free maintenance sprayer. This is Having heavy Duty 12V/12AH Battery with Heavy duty trigger and Hose with 100 PSI Pump. - made with high qulity P.V.C.